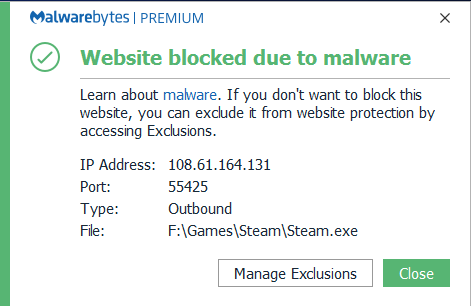 Malwarebytes has been blocking outbound connection after launching steam. 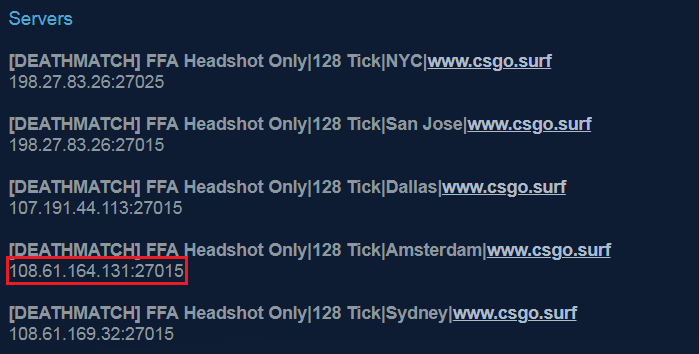 I looked up that IP address and I found that it's the server IP of a CS:GO game server I played on awhile ago, which probably had me download some custom files. So I tried deleting the game and reinstalling steam, but that didn't work. I'm not sure what's going on, because I haven't noticed any other issues and none of the scans are detecting anything. I noticed that i sent in the wrong screenshot in the OP. I'm sorry if it caused any confusion. Here is the correct one with the matching IP along with your requested fixlog. No, the problem still persists. After launching steam I always get that popup in about 30 seconds. I suggest you start a service topic in this support forum. Let an expert have a look if this is s False positive or not.